Alibaba's Singles Day -- which kicks off this Sunday, Nov. 11 -- is a key event for investors to watch this year. The global event is poised to be bigger than ever, but consumer sentiment in China could put a damper on sales. Alibaba's (BABA - Get Report) Singles Day is around the corner -- and with the commerce giant's stock slumping in recent months, it's a key one to watch. The shopping extravaganza, which takes place this Sunday, Nov. 11, originated as an "anti-Valentine's day" festival for singles -- promoted as a chance for shoppers to spend on gifts for themselves and other single friends. And it's grown into a massive global showcase that brought in $25.3 billion in sales in 2017, both online and offline. Last year's gross merchandise value of $25.4 billion on Singles Day represented a 43% jump from the previous year. "If you look at the 10-year evolution of 11.11, it's been very online-commerce oriented," said Liyan Chen, manager of international corporate affairs at Alibaba Group. "In the past two years, we've been able to drive traffic to retail stores. For consumers, it's not just an online shopping festival -- it's an immersive, integrated holiday that can be celebrated online and offline." That involves not just shopping deals across Alibaba's own ecosystem of properties and strategic investments, such as local services platform Ele.me, but also live events and partnerships with outside brands including Starbucks (SBUX - Get Report) . Alibaba calls Singles Day the biggest shopping event in the world, involving 140,000 brands and merchants in 2017 and processing nearly double the sales of U.S. Black Friday and Cyber Monday sales combined. This year is projected to be even bigger, with 180,000 brands and 200,000 offline retail locations participating in Singles Day. And forecasts suggest that total sales will outpace last year as well. App analytics firm App Annie, which tracks mobile commerce, estimates that total global spending for Singles Day will exceed $32 billion this year -- which would make it the biggest single day in history in terms of total consumer spend, according to the firm's analysis. Whether that will be enough to impress investors is another question. There is some cause for caution around Singles Day this year, according to experts. Alibaba's stock has been caught up in the U.S.-China trade conflict and weakened Chinese currency -- which is dragging down consumer confidence in China, according to Christian Magoon, CEO of Amplify ETFs. That means Chinese consumers may be less willing to open their wallets than in past years. On its September quarter earnings call on Nov. 2, Alibaba revealed better-than-expected quarterly earnings, but a lowered forecast for 2019, which CEO Daniel Zhang pinned on "fluid macro-economic conditions." Said Magoon: "Recent economic and stock market weakness in China and many emerging markets will likely have a negative impact on Singles Day sales. Consumer sentiment can be fickle, and the impact of a stronger U.S. dollar, declining stock market valuations in many international markets including China, combined with the threat of a major trade war, could dampen the growth of Singles Day this year." Another factor is that the event has simply gotten so big that it's tougher to make a splash. "I don't know if they have a lot more tricks up their sleeve," added Gil Luria of DA Davidson. "The first couple of years, it was a very big deal and drove the stock to a large extent, but I would say the last couple of years it hasn't been quite as much of a driver." Nonetheless, for Alibaba investors it's a key factor to watch. For Alibaba, the upcoming shopping extravaganza is a chance to show off the strength of its ecosystem and extensive reach outside of China. 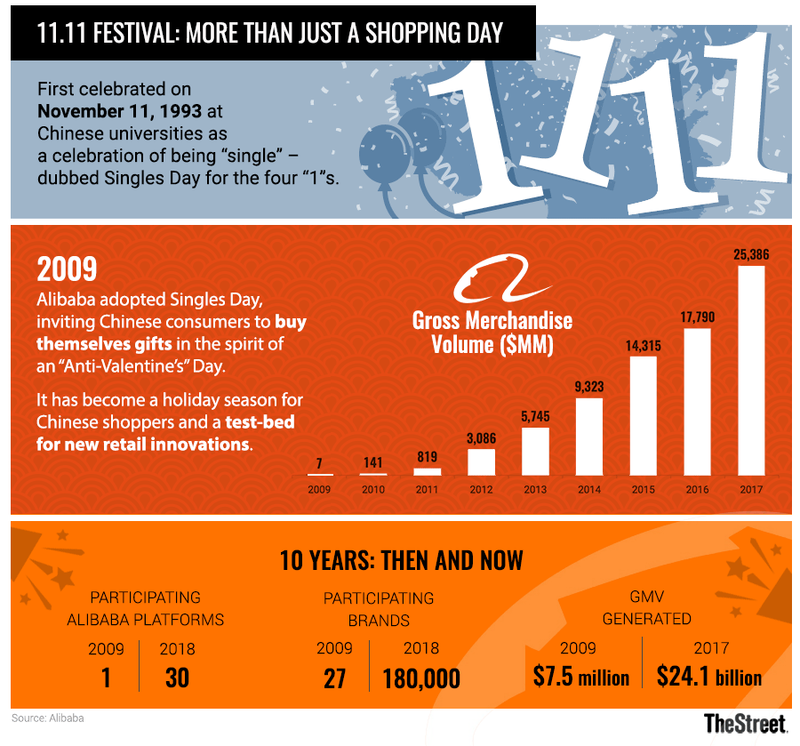 "Results from Singles Day will be the next big catalyst for Alibaba investors," added Magoon. Alibaba's stock was down 3.3% on Friday morning; shares are down 16% so far this year.